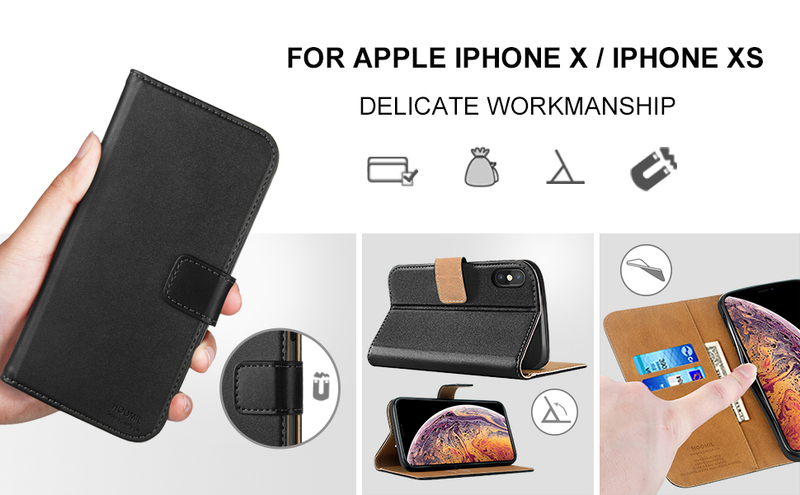 NOTE: This leather case is compatible with APPLE iPhone X and iPhone XS, please check your cell phone model before buying. PROFESSIONAL DESIGN: Strong, double sided magnetic closure secures your phone, money and cards in safety. 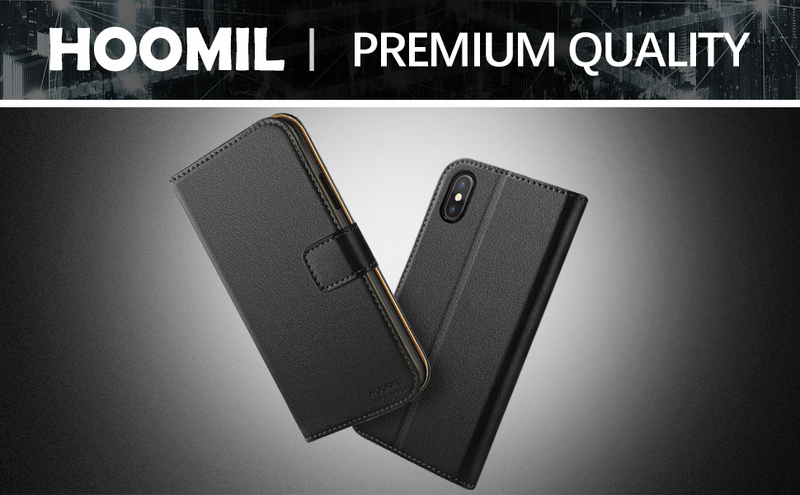 TOP QUALITY: HOOMIL iPhone X / XS case is made of high quality PU leather and flexible TPU, protects your smartphone from accidental drops, bumps, dust and scratches. PERFECT VIEWING ANGLE: iPhone X / XS flip case can be switched to a horizontal position and act as a stand function, convenient for movie-watching or video-chatting. MULTI-FUNCTION: The iPhone X / XS wallet case featuring 2 card slots and 1 money pocket, you can carry around your ID, credit cards and cash, without having to take your wallet with you. CONVENIENT TO USE: Precise cutouts for speakers, camera and other functional ports, allowing you access to all ports and controls easily, and allow to charge without taking off the case. NOTE: This leather case is compatible with iPhone XS MAX, please check your cell phone model before buying. This mobile phone cover for Apple iPhone XS Smartphone (5.8 inches) is made of high quality PU leather, protects your cell phone from accidental drops, bumps, dust and scratches. Durable and hard-wearing PU protects the screen against scratch and dirt. Soft TPU Inner Shell features 4-corner protection, sides and back protection, the raised edges to protect the screen from being scratched or being touched the ground. High-quality material makes your iPhone XS looking more stylish, and enjoy the professional protection in your daily life. Magnetic Lock - Makes your phone, money and cards in safety and prevents your Apple iPhone XS from being opened accidentally while in your pocket. Stand Feature - The flip cover can be converted as a stand function, support for your phone in a horizontal position, ideal for watching videos. Card Slots - Hold on to your essential credit cards, business cards, driver's license and IDs when you're on the go. Secret Pocket - A side pocket to store your cash, bills or additional cards conveniently. Precise cutouts for speakers, camera and other functional ports. Allowing you access to all ports and controls easily, and allow to charge without taking off the case. Information on new products, sales and promotions will be directly sent to your inbox.